Upper Woods Creek provides important habitat for spawning and summer rearing of native salmonids. However, the Rapid BioAssessment performed in 2008 identified a lack of winter habitat due to limited floodplain interaction. In 2008-2009, in cooperation with ten Woods Creek landowners, 23 large wood structures were installed on 2.7 miles of stream to restore this winter-time function. In addition, five off-channel alcoves were developed to provide backwater habitat. Prior to the project, landowners had expressed concern at Woods Creek neighborhood meetings about the amount of wood that was transported downstream during winter storms, often lodging on bridges. 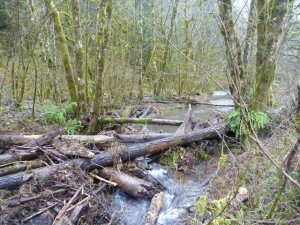 After the storm of 2012, some landowners reported that the amount of mobile wood seemed to be less as it was trapped in the upstream log jams. Support for this project came from The Freshwater Trust, Jubitz Family Foundation, Starker Forests, Inc and USFWS Finley Wildlife Refuge.